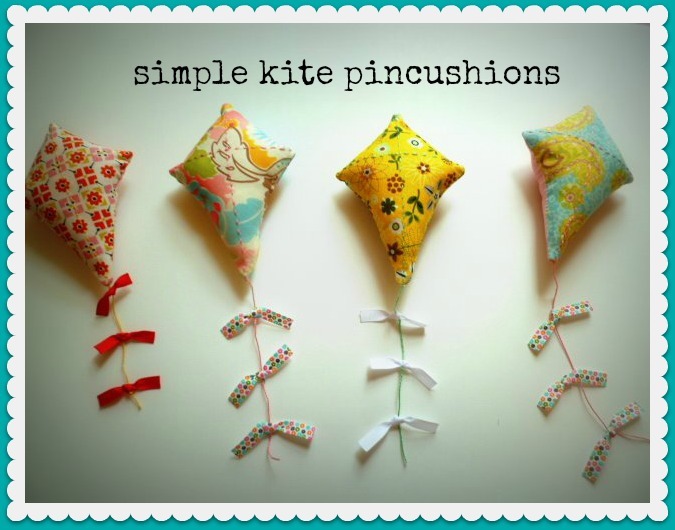 craftytammie: let's go fly a kite! or at least make one to look at while we sew! for my fab guests from sew full of summer, i decided to stitch up summery pincushions. i saw these over at riley blake! i followed their tutorial, with a couple changes, and they turned out super cute. so i thought i'd share how i made them. best of all, mine are made from two 5 inch charms! first, i made a template of a kite shape. here's a quick way to do it. i save all the paper sheets and cardboard from charm packs - i reuse them for templates and patterns. so i grabbed a paper slip and drew a line, corner to corner. this is the spine of the kite. next, i drew a line about 3 1/2 inches on each side from the top corner, for the cross piece. so i chose two charms and cut out my kites. i wanted to hand stitch the lines on it. i ironed it in half to give me a guideline. then i stitched. and i have a question - wouldn't it be nice to have some kind of marks on the end of your needle, something to gauge how big of a stitch you've made? do you follow what i'm saying? maybe they make these already, i don't do much handwork. but it seems like a good idea to me. anyways, after you've embellished your kite, stitch, right sides together, leaving an opening for turning. i added a kite tail of perle cotton, tucking a length inside prior to stitching together. stuff with whatever you'd like. i used polyfill, but put some batting scraps in the center, to give it more weight. once i stuffed it and sewed up the opening, i took little lengths of grosgrain, tied them into a knot, and stitched my tail through them, knotting beneath the bow before adding the next. to prevent the bows from fraying, you can either heat seal the edges or use fray check, or clear nail polish. 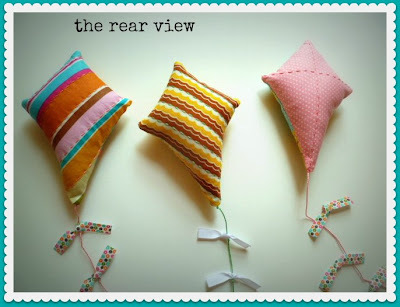 anyways, a cute quick project, fun to make and look at! as always, if this inspires you to make one, i'd love to see it! just add it to the flickr pool or email me a pic - you just might see it featured here! tell me, what do you use to stuff your pincushions?